House Republicans said on Wednesday that they are pushing a plan to delay for five years the penalties for failing to buy health insurance under Obamacare, and to use the savings to spare doctors from a steep cut in Medicare payments. Delaying until 2019 the financial penalty for not signing up for health insurance would slow down Obamacare signups and save the government billions of dollars that would otherwise be paid out in taxpayer subsidies to enrollees, the Republicans say, citing Congressional Budget Office (CBO) estimates. Democrats derided the idea as a “poison pill.” They complained that House Republicans have tried dozens of times to change or repeal Obamacare and now proposed another change to a bipartisan deal making a long-sought repair to the formula used to determine Medicare payments to physicians. House Speaker John Boehner confirmed the Republican strategy when asked about it in a Capitol hallway. When a Reuters reporter noted that the Democratic-run Senate might not like the idea, Boehner said, “We’ll see.” The White House threatened to veto the legislation. 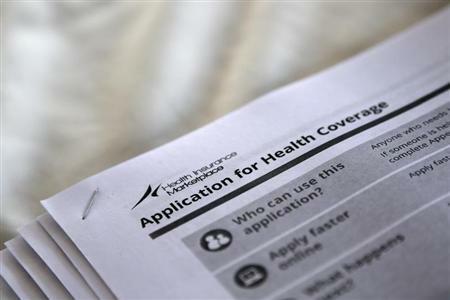 U.S. Health and Human Services Secretary Kathleen Sebelius said Wednesday there will be no delay in the penalty for failing to obtain health coverage this year. The bipartisan deal to repair the Medicare funding formula was unveiled with fanfare last month by lawmakers in both parties and both houses of Congress. The agreement would prevent a 24 percent cut on April 1 in payments to doctors who participate in the traditional Medicare plan. But they did not work out a way to pay for the repair, which CBO says would cost $138 billion over 10 years. Congressional aides say there are no serious cross-aisle discussions about how to come up with the money. Floor debate over the bill to repair the Medicare formula could start on Thursday. The proposal to pay for it with a five-year delay in enforcing the Obamacare individual mandate penalty was expected to be offered as an amendment. A vote is planned by Friday, congressional aides said. Describing the House strategy, Republican Representative Tom Price said delaying the individual mandate penalty for five years would raise “just north” of the $138 billion that the CBO says is needed to pay for permanently fixing the Medicare funding formula, a payment mechanism called the sustainable growth rate. A CBO analysis released on Wednesday said the amendment to delay the individual mandate penalty until January 2019 would save $169.5 billion over a decade. Postponing the penalty would increase the number of people without health insurance by about 13 million people by 2018, resulting in 43 million uninsured, the analysis said. Price said the Obama administration had already effectively delayed the individual mandate penalty by rule for nearly three years, citing a plan to let people whose health insurance policies have been canceled to claim hardship exemptions from the individual mandate penalty until October 2016. “That gets the resources available to once and for all repeal the sustainable growth rate (Medicare funding formula), and replace it with a much more workable formula for physicians and patients,” Price said. Not all Republicans are in love with the idea. Representative Tim Huelskamp, a Tea Party favorite, said he wondered whether postponing the Obamacare individual mandate penalties would really pay for fixing the Medicare formula. “I’d have to look at the math … but I think it would be completely irresponsible to pass something that is really not paid for,” he said.